Thank you Village Harvest for sponsoring this post. Every day Village Harvest is planting seeds of change and growing possibilities, one bag of goodness at a time. 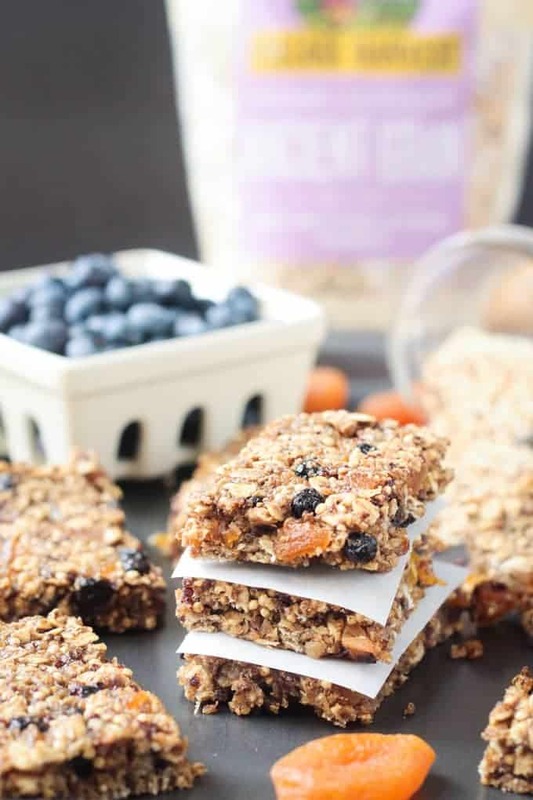 Ancient Grains Breakfast Bars – quick and easy and made with nutrient packed gluten free whole grains, these bars make a hearty breakfast or satisfying snack. They’re also nut-free which makes them great for school lunch boxes, too! Kid and adult approved! I don’t know about your family, but my kids seem to believe that they should be eating at least once an hour during the summer months. As soon as they leave the table from a meal, they are asking for a snack. And they are good eaters, so it’s not like they are leaving the table hungry. They would happily eat crackers or pretzels all day if I let them, but they are just as content grabbing an apple or some sliced cucumbers and hummus. Because they are running around outside quite frequently on these warmer days, they do need extra fuel to keep them going. 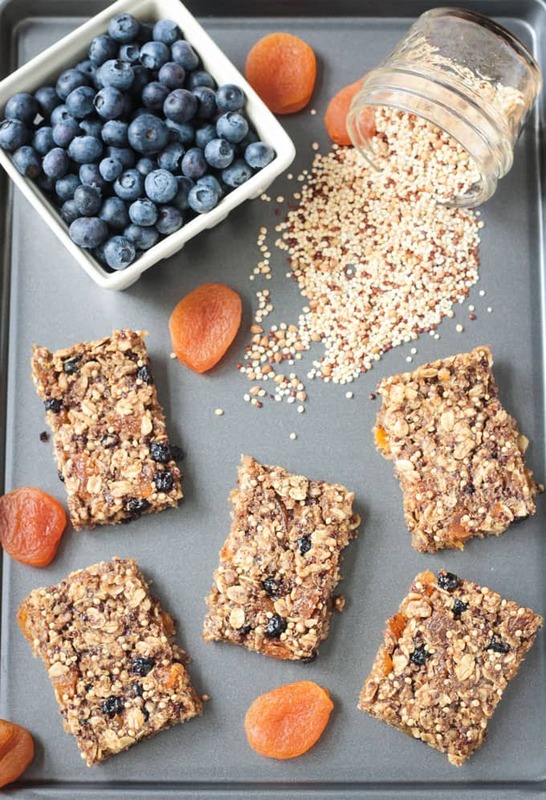 These Ancient Grains Breakfast Bars are the perfect way to start their day or re-energize them during their adventures. Once school is back in session, you bet these whole grain bars will satisfy their hungry tummies during homework time while they wait for dinner. And they’re not just for kids – adults love them too! I’ve packed these bars full of whole grains – thanks to Village Harvest Ancient Grain blend – seeds, and dried fruits. They’re gluten free, oil free, refined sugar free, and nut free. They have great texture from all the different grains, yet are soft and chewy. They’ll keep in the fridge for a few days, but you can even freeze them to store them for longer. Let frozen bars sit out for a few minutes at room temperature to soften them back up. Put a frozen bar into a lunch box and it will be perfect by lunch time. Village Harvest is a company passionate about sustainability. They believe that means not only taking care of the planet, but also the workers that help bring the healthy whole grains to your door. They donate 1% of profits to run programs benefiting the farmers and local communities from which they source their products. They also donate 1% of their employees’ time to charitable causes and sustainability efforts. As you can see, their products are about more than just rice – they’re about discovering new possibilities at home in the kitchen and thousands of miles away in the fields. This is a company whose products I’m proud to use! 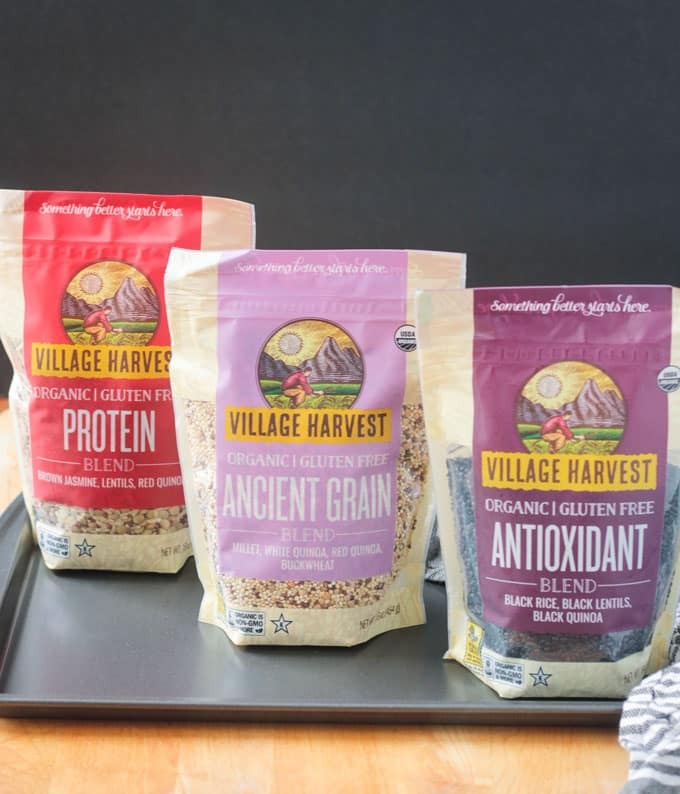 Village Harvest just introduced three new Organic Benefit Blends – Organic Antioxidant Blend, Organic Ancients Grain Blend, and Organic Protein Blend – each offering their own distinctive combination of healthful goodness. These unique gluten free blends are filled with rice and grains and the nutrients your body craves. I used the Organic Ancients Grain Blend in my breakfast bars proving that these healthy blends are not just for the dinner table. Find these three Organic Benefit Blends and more at the NEW Village Harvest Online Shop. If you’d like to see these products sold at a store near you, I encourage you to fill out this Product Request Form. My favorite of the three new blends is the Ancient Grain blend. It has millet, red and white quinoa, and buckwheat – three grains I love to use in my kitchen. 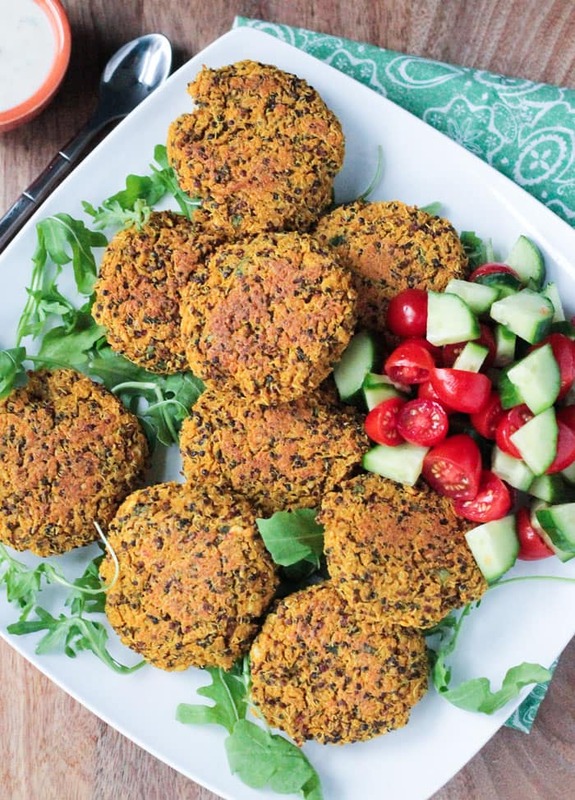 I use millet in these Black Bean Patties, quinoa in this Spinach Salad, and buckwheat flour in these Pancakes. You could use this nutritious blend anywhere you would usually use rice or your favorite grain. It’s an easy way to pack a lot of nutrition into one dish. 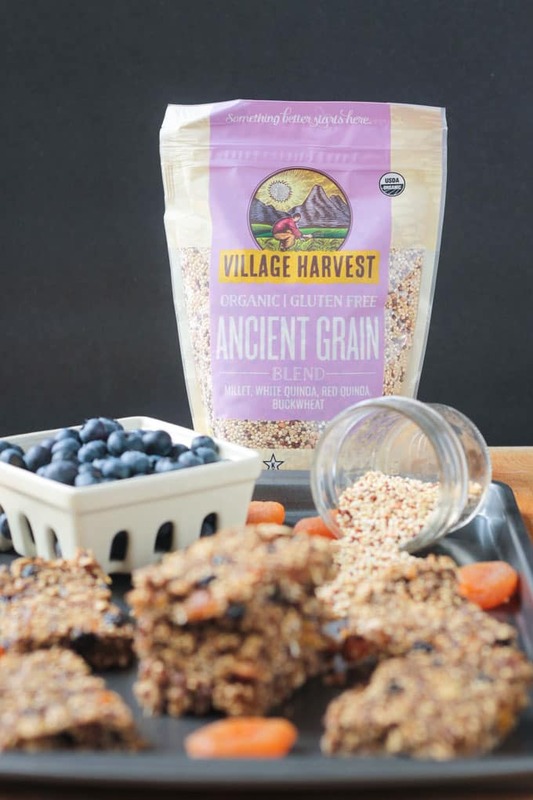 I hope you love these Ancient Grains Breakfast Bars as much as we do. If you try them, please come back and leave me a comment below with your feedback and star rating. You can also find me on social media. Be sure to tag @veggie_inspired and #veggieinspired so I’m sure to see it. Enjoy! Ancient Grains Breakfast Bars - made with nutrient packed gluten free whole grains, these bars make a hearty breakfast or satisfying snack. Preheat the oven to 350 degrees F. Line an 8x8 baking pan with parchment paper. Let the ends overhang a bit to use as "handles" later to easily remove the bars from the pan. 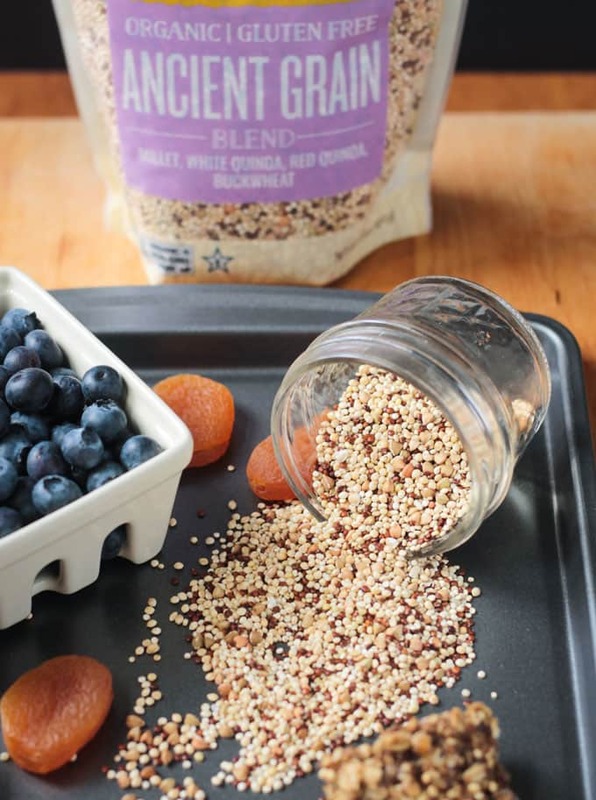 Once the grains are cool, combine them in a large mixing bowl with the oats, flaxmeal, oat flour, coconut sugar (if using), salt, dried blueberries and dried apricots. In a small bowl, whisk together the sunflower seed butter, maple syrup, and vanilla extract until smooth. Pour the wet ingredients over the dry and stir well to combine. Make sure that all the dry ingredients are coated. Press the mixture evenly into the prepared baking pan. Press down firmly so the mixture is compact. Bake for 20-25 minutes until the edges start to turn golden. Place the baking pan on a wire cooling rack to allow the mixture to cool in the pan for at least 20-30 minutes. They will firm up as they sit. Carefully remove from the pan using the parchment "handles" and place onto the cooling rack to continue to cool completely. Once cool, cut into bars. Leftovers can be stored in an air-tight container in the fridge or freezer. They can also be individually wrapped and frozen for easy grab-n-go breakfasts or snacks. *If you don't have oat flour, you can make your own by adding whole oats to a food processor or coffee grinder and pulsing until ground into a flour consistency. I really need to start making homemade bread – that sounds delicious! But, yes, these bars are perfect for the kids before school…or on the way to school cause we slept in. Ha! You do! It’s unbeatable, therapeutic, and so darn easy, really. If you need a solid recipe, let me know! I make 100% whole wheat bread with the white-wheat flour often. I taught my niece how to make it and she used to make a loaf herself every week for her school lunches. Yes, please send me the recipe! I use the White Whole Wheat often – my kids would love homemade bread! Thanks, Alisa! These look so yummy! 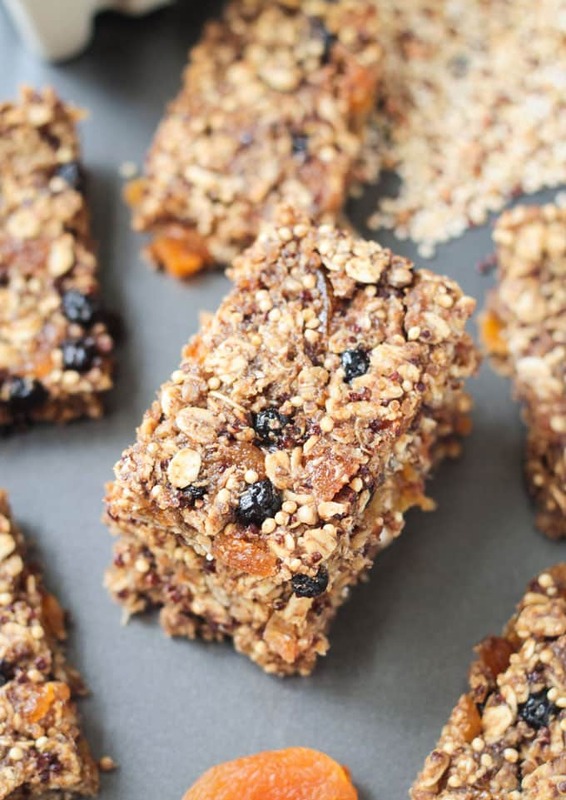 My kids beg me for snack bars all day long, so I’m sure they’d love these! Glad it’s not just my kids! 🙂 Hope they love these, Sarah! They’d be perfect for that! Enjoy, Alisha! I’m with your kids, I definitely eat once an hour. 🙂 These look and sound amazing, Jenn! 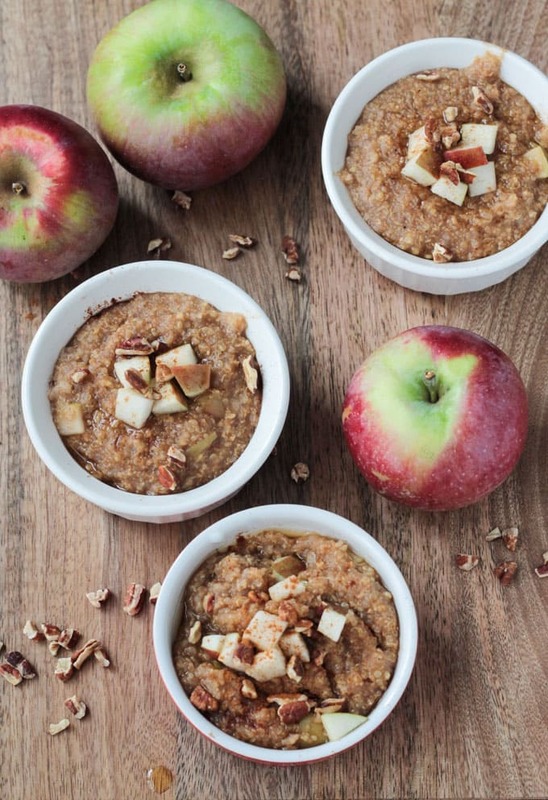 These would make an excellent “on the go” breakfast! These look so delicious and much healthier than any store bought kind. The grains look like something I’d love to cook with – I’ll check them out! The grains are great for sweet and savory – you’d love them. Thanks, Mary Ellen! These look and sound amazing! They have been pinned and I will be making these for my family! Oh, thank you, Juli! I hope everyone loves them! Let me know how they turn out. These bars look so good! And I want to try Ancient Grains. All the blends sound delicious! Thanks, Amy! The ancient grains make them so hearty and filling! Healthy and delish! Just what I need for breakfast. This is a great on-the-go snack or breakfast. Love it! I’m really getting in to my ancient grains of late, but funnily enough it has been for savoury uses. I am going to have to give your bars a go to change things up a bit. I think most people use them in savory recipes and we do most often too. Its fun to change things up a bit sometimes, right?! Hope you love them, Sara! Homemade granola bars and breakfast bars are the best. I’m also loving all the ancient grains in this version! Thank you, Lisa! It really makes them so hearty!